Miami, FL has some of the worst traffic in the nation. Between residents, domestic and international tourists, and commuters, its roads are jam-packed from sunrise to sundown. Unfortunately, it’s hard for drivers to get around Miami safely. More car accidents are reported in Miami-Dade County than anywhere else in the state. Motorists, bicyclists, and pedestrians will continue to get hurt until Miami addresses these issues. Lawmakers and city officials have acknowledged that there’s a lot of work to do. Fortunately, the city has also taken steps to make its roads safer. Traffic accidents have always been problematic in Miami. However, the rate at which drivers are getting into collisions has increased significantly in recent years. In 2014, there were 60,191 car accidents in Miami. By 2017, there were 65,986 reported collisions in the city. That’s an increase of nearly 10 percent in just four short years. More recent statistics indicate that this trend is continuing. If roads are in poor condition, it’s difficult for drivers, pedestrians, and bicyclists to get from one place to another safely. Unfortunately, there are several safety concerns regarding Miami’s existing roads and infrastructure. These concerns are highlighted in infrastructure safety reports published by independent organizations. Every few years, the American Society of Civil Engineers (ASCE) publishes an analysis of road conditions in the United States. In its most recent report, infrastructure in Florida received a “C” average. The low grade is due, in part, to crumbling infrastructure in its most heavily-populated cities, including Miami. Florida is growing, but its roads and highways are not keeping pace. In the past 30 years, the number of miles logged on Florida roads has increased by 84 percent, but highways have only been expanded by 25 percent. Florida communities are not spending enough money to keep its roads, bridges, and infrastructure in safe operating condition. Cities like Miami are underfunding essential road improvement projects. Traffic and congestion cost Miami drivers an average of $1,000 every year. The state of Florida has more than 122,000 miles of public roads and highways. The ASCE determined that 9 percent of those roads, including many in urban areas like Miami, are in poor condition. A study published by Wallethub rated the best and worst cities to drive in the United States. The study analyzed several factors, including (a) traffic and infrastructure and (b) safety. Miami ranked near the bottom in both of these categories. Why did Miami rank so poorly? The city’s dangerous intersections and pothole problems were likely key considerations. Miami has some of the most dangerous intersections in the state of Florida. Many of the most violent and devastating accidents in the city happen at or near these intersections. Intersections in Miami tend to be particularly dangerous because they’re not designed to accommodate heavy traffic. As congestion increases in Miami, so do the number of accidents at these crossroads. Generally speaking, Florida’s roads are in fairly good condition. The same can’t be said for congested urban areas like Miami. Drivers frequently complain about road conditions. One of the biggest complaints is the number of potholes on city roads. Potholes can be hard to avoid, cause extensive vehicle damage, and contribute to a significant number of collisions. Given the state of Miami’s roads, it’s more important than ever for motorists to pay attention and drive safely. Unfortunately, driver negligence is a leading cause of car accidents in the city. Aggressive Driving: Drivers spend a lot of time sitting in Miami traffic. The longer the drivers crawl along in bumper-to-bumper traffic, the more impatient and irritated they become. As a result, many resort to aggressive and dangerous behaviors to make up for lost time. Speeding, making unsafe turns, and racing through intersections to beat traffic signals contribute to a significant number of crashes every year. Drunk Driving: Miami is a hot spot for nightlife, restaurants, and bars. Tourists from all over the world travel to the city to unwind and take in the city’s exciting atmosphere. Unfortunately, not everyone calls an Uber or opts for public transportation. Many drivers get behind the wheel while under the influence of alcohol. Every year, hundreds of car accidents in Miami involve drunk drivers. Drugged Driving: Legal and illegal drugs impair a driver’s ability to navigate Miami’s roads safely. Since 2014, the number of drug-related accidents, injuries, and fatalities has increased. In 2016, there were 15 reported car accidents involving a drugged driver, 9 of which were fatal. Commercial Accidents: I-95, one of the nation’s most heavily traveled corridors, runs right through Miami. As a result, the city sees its fair share of commercial traffic. Unfortunately, commercial vehicles are involved in a staggering number of crashes. In 2016, there were 8,314 commercial vehicle accidents, an increase of 8 percent from 2014. Commercial accidents happen quite frequently because (a) commercial drivers are often fatigued and (b) drivers of smaller vehicles refuse to share the road safely. Distracted Driving: Thanks to advances in technology, there’s pressure to remain constantly connected to the world. This is true, even when you should be focused on an important task like driving. Too many drivers in Miami are paying attention to their phones, rather than the road. When a driver takes his or her eyes away from traffic, they’re significantly less likely to see hazards and dangerous road conditions. As a result, avoidable hazards are contributing to more accidents than they should be. Miami knows that its roads aren’t in great condition. It also knows that these hazardous road conditions are contributing to a staggering number of traffic accidents every year. In recent years, lawmakers and officials have taken steps to embrace initiatives to make city roads and highways safer. 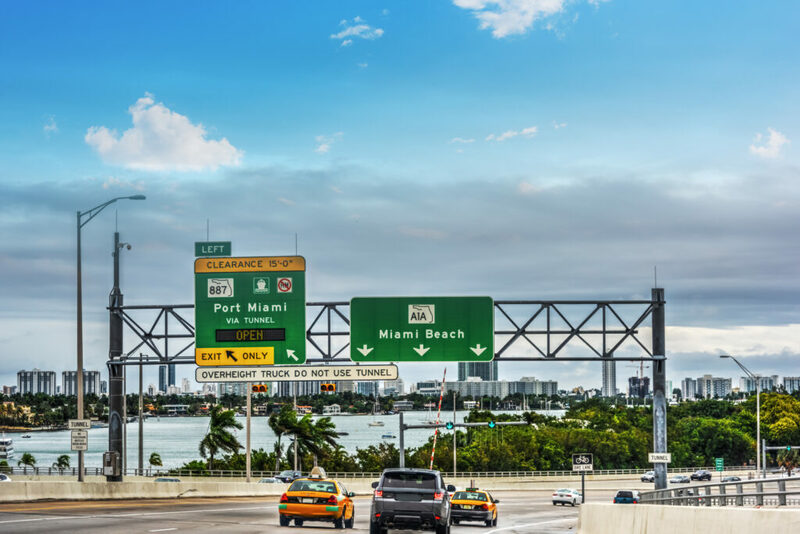 Vision Zero: Miami recently launched a Vision Zero initiative, which aims to eliminate traffic deaths and injuries in the city by 2030. Exhaustive studies have been conducted to (a) pinpoint the leading causes of severe accidents and (b) identify solutions. The initiative focuses on three distinct areas: engineering, enforcement, and education. Miami has pledged to fund improvements to infrastructure, strengthen traffic safety laws, and advance motorist safety education programs. Bike305: Bicyclists and pedestrians face tough conditions on Miami roads. Infrastructure was designed to accommodate high-speed traffic, not alternative modes of transportation. In order to reduce the number of bicycle accidents across the city, officials launched an initiative called Bike305. The program encourages residents and tourists to take advantage of 27 miles of dedicated bicycle and pedestrian infrastructure. Mass Transit: Miami’s roads are crowded and they’re only getting worse. The city has funded programs to expand and improve upon its mass transit systems. Public transportation can relieve some of the congestion on Miami and help to reduce accidents across the city. For more information on car accidents and traffic safety, or if you have injured in a car accident in Miami, FL, then contact Lavent Law by visiting https://www.laventlaw.com.